People don’t want to talk about ghosts. One night at university I was staying with my girlfriend. She had just fallen asleep but I was still wide awake. After a while I noticed the figure standing in front of the wardrobe. It was a young woman looking at herself in the wardrobe mirror and when I propped myself up on my elbows to get a better look at her, she turned to look at me. This may have been the single strangest moment I’ve ever experienced. The figure appeared as if a woman had been cast in glass and filled with pale smoke. When she looked towards me, however, I did not feel she was seeing me at all. After a few seconds the figure moved towards the wall and the spell was broken. I woke up my girlfriend and told her all about it. Eventually we fell asleep, and next morning she went to the communal kitchen. Before she could speak, a friend who lived next door to her said she had seen a woman walking through her room last night. It was a Monday and I was early for the morning seminar, so I popped into the philosophy common room. Here I found nobody was remotely interested in my experience, and the only possible explanation was that I was deluding myself. As the day wore on I told several friends about it, but was surprised by their lukewarm lack of interest. My failure to interest anyone in this experience became another interesting aspect of my ghostly encounter. Ghosts crop up continually in folklore, religions, stories and literature. The idea of ghosts is woven into the culture we live in. The idea of The Holy Ghost is central to Christianity for example. Even now there are fairly mild-mannered ghosts that populate Hogwarts in the Harry Potter books. 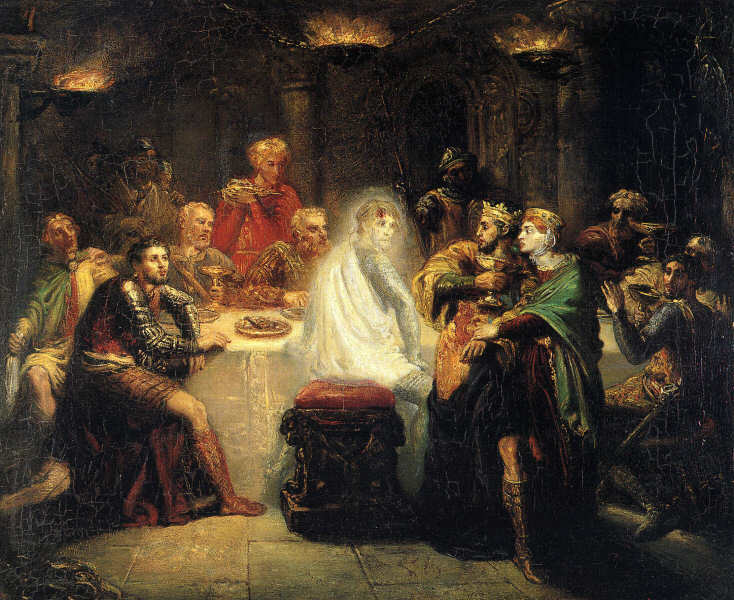 Ghosts in literature are often seen by people on the edge of madness such as Hamlet and McBeth, or are terrifyingly ambiguous such as the ghosts in Henry James’s The Turn of the Screw. One reading of all these ghosts is that they could be described as messengers from the subconscious mind, signalling something that is being repressed. While in A Christmas Carol, Dickens uses his time travelling ghosts as wonderful structural device to help Scrooge examine his own folly, and the ghosts are agents of a troubled conscience. We are happy with ghosts in fiction. It’s where they belong. There are some great ghost movies of course, such as The Shining. In recent decades the ghost hunting ‘Paranormal Reality Shows’ have proliferated on TV. What little of this I have seen seemed comically bad. But isn’t that the point? Addressing the reality or otherwise of ghosts is something best left to entertainers, storytellers and charlatans. So what do I do with my experience? What do I do with the knowledge that I found out later that a girl who had lived in the room the year before had been killed in a motorcycle accident? Perhaps I experienced a delusion and must accept my imagination is over-active. While I can accept that there are perfectly logical explanations I think they are less likely than what I personally experienced. For me it wasn’t an unreal experience, in fact it was the very opposite. It still seems to me to be one of the realest things that ever happened. If this all sounds a bit crazy it’s because talk of ghosts is still a taboo for rational people. This entry was posted in Autobiographical and tagged A Christmas Carol, Charles Dickens, Ghosts, Hamlet, Henry James, McBeth, Paranormal, Paranormal Reality Shows, The Turn of the Screw, William Shakespeare. Bookmark the permalink.